The Followers of The Master were picked up by Jamie’s colleagues in the Time Agent equivalent of a prison van. Jamie didn’t go with them. Wyn, who had been contemplating the pitfalls of a long distance relationship with Jamie once she moved on, was delighted. “Don’t you snog?” The Doctor asked. Stella laughed. That was a pretty good description of what Jamie and Wyn were doing right now. “Yes,” he answered. “Oh yes.” His hearts played a bittersweet tune as he thought of Dominique, who he had loved for a lifetime, Rose, who he had WANTED to love for a lifetime, and who still haunted his dreams sometimes, his lovely first wife who had made him a father and grandfather the first time around. Yes, he had known true love. And it was beautiful. It was WORTH the inevitable grief that came from giving that love to Human women who faded and died. For a very long time, he had told himself it WASN’T worth it. He had kept himself aloof from romantic love. But he was wrong. Once every millennia at least, he needed to risk his hearts. The rest of the time he had friends like Wyn, and surrogate daughters like Stella who filled the one gap in his life he had felt most keenly ever since his granddaughter moved on from looking after a time-bitter old man to find true love of her own. He looked at Stella and smiled warmly at her. Jo had been one of those surrogates and Stella looked so much like her that it was impossible not to love her in the same way. Stella looked at The Doctor and wondered what he was thinking about. Then she came closer and hugged him - because he looked like he needed a hug. The Doctor laughed. He looked at a list of possible places they could have a peaceful and untroubled time and smiled as he found the very thing. “A space cruise!” Stella had laughed at the idea when he proposed it, and she was still laughing as she lounged by the pool on the fifth blissful morning. She looked at The Doctor, whose only concession to the fact that the pool deck was as warm as a Mediterranean beach was to take off his jacket and loosen his tie as he occupied the sun lounger next to her. Beside him, Jamie looked like something from an American glamour soap in a bikini top and sarong. If Stella had any ambitions for her future it was to look THAT good when SHE was forty. Wyn was swimming. She was the only person who WAS. A swimming pool on a cruise ship, whether on water or in space was never really meant for serious swimming. People lay on inflatables or splashed around. But Wyn preferred to swim. Stella knew why. She was never particularly confident about her body, but in the water, weight and body mass didn’t have much to do with it. She swam as well, if not better, than most thin people and she actually did look graceful and athletic as she sliced through the water. Stella looked up. On a boat, this would be the top deck with nothing but a blue sky and sun. On a space cruiser, it was still the top deck but it was enclosed in an exo-glass roof. It shielded the dangerous rays of the Orinic twin suns and transferred their heat and light to the deck so that it was possible to sunbathe safely while admiring the view of a solar system of six planets, all close enough to the suns to be tropical paradises. The Cruise Star Ship Douglas Adams, nicknamed The Heart of Gold for reasons most of the 34th century passengers didn’t understand, had already visited one of the planets, Orinic II. They had enjoyed a wonderful two days exploring the spice market of Orin City and watching multi-coloured birds flying in the powder pink sky by the great Orin Lake. If there was one problem with these planets it was lack of imagination in their place names, Stella thought. Wyn pulled herself out of the water and wrapped a sarong around herself as she came and sat with Jamie. Of course they kissed. Stella and The Doctor made a point of not watching. “You’d think they’d be bored with all the lip suction by now!” she commented. “Probably NOT,” The Doctor noted. “One day my prints will come, said the impatient detective,” he added. Stella watched The Doctor’s face. His ability to tell a bare-faced lie without even a flinch or a flicker was actually rather amazing. It was a good job he was an honest man, generally speaking. If he was a crook or a conman he could fleece the universe with a smile and a twinkle in his eye. Stella had been avoiding looking at that man. He was from a planet called Agorado and as well as the six arms he had a long, forked tongue and what he could do with it made Wyn and Jamie’s ‘lip suction’ look tame. “The Doctor is the smuggler!” Stella laughed. Jamie looked at The Doctor and wasn’t at all sure if he was joking or not. Jamie looked at Wyn and smiled. She reached and hugged her around the shoulders. “And if he’s wrong, we’ll have a terrific holiday at HIS expense!” Wyn pointed out. The Doctor turned and grinned at Stella. They WERE having a terrific holiday since it WAS a wild goose chase made up by him to keep Jamie with them a little while longer. It was later, when they were getting ready for the evening dinner and dancing that Wyn slipped into The Doctor’s cabin. He was dressed in a neat black evening suit and tie and was fastening his cufflinks, a job all men had trouble with. Wyn sat beside him and took over the job. She knew what he meant by that comment, and she knew it was probably better not to let him dwell on it. Anyway, she had something she needed to say to him. The Doctor didn’t say anything in response. But she knew she was right. The Doctor gave her his arm and they walked together up to the Heart of Gold deck where Jamie and Stella caught up with them and The Doctor swapped sisters. He walked into the grand dining hall with Stella looking proud to have him as her ‘date’ for the night while Wyn and Jamie went together. They ate together at a table for four and then there was dancing. Jamie and Wyn made a beautiful couple. The Doctor took Stella out on the floor. They both noticed that Jamie was alternating between her male and female form each time the music changed. “How come the clothes change, too?” Stella asked noticing that the male Jamie was wearing a rather suave dark blue suit and the female a pale blue evening dress. “Very cool,” The Doctor agreed. Stella had several offers from other men, and The Doctor was happy to let her be taken on the floor by the most Human looking of them, that is ones with the same number of limbs as she had. He, himself, was being eyed by some attractive females of several species, but he took a seat back at the table and watched Stella’s dance partners carefully in case any took too much of a liking to her. “Dance with me?” Jamie asked The Doctor as Wyn came and sat at the table and motioned to a steward with a tray of champagne glasses. The Doctor stood and let her lead him out on the dance floor. But The Doctor wasn’t listening to her. He had stopped dancing and was standing there, rigid, his eyes not focussed on anything in this room. “You wouldn’t. It’s reaching me telepathically. I have to.…” He turned suddenly and ran, colliding with two of the Agoradon’s wives as he danced with all three of them at once. The Doctor murmured his apologies and ran off again. Jamie turned and looked at Wyn and Stella who both looked back at him anxiously before Wyn tore off after The Doctor. Jamie looked at Wyn, then turned back and returned to where Stella was still waiting. She morphed into her male form, dressed in his dinner suit and took hold of Stella’s hand, taking her out onto the dance floor. Easiest way, he thought, of looking after her and taking her mind off whatever was bothering The Doctor and her sister. “Doctor?” Wyn caught up with him at the entrance to the freight hold, where he had to use his sonic screwdriver to break in, of course, that being an area that was off limits to passengers. The lock beeped rapidly as the 32 digit code was overridden and the door slid back. Worryingly an alarm went off, but The Doctor ignored it, dodging the assortment of freight, none of it contraband, until he reached the TARDIS. As he unlocked the door there was a shout from a security guard who had been alerted by the alarm, but he ignored him, too. So did Wyn as she ran inside the TARDIS after him. “I am always calm,” K9 answered. “It’s the Cloister Bell, isn’t it?” Wyn listened to the deep, sonorous bell that sounded loudly in the console room, though it had an echo to it as if it was coming from some other part of the TARDIS. “Yes. I heard it. In my head. Something’s coming. Something really bad.” He turned on the navigation scanner and hit it twice to get the picture to display properly. When it did he gave a dismayed yelp. Wyn felt a slight movement as the TARDIS dematerialised and rematerialised almost immediately and the viewscreen showed them in space, hovering above the SS Douglas Adams. As the TARDIS revolved slowly she saw something else. “It’s a time storm,” The Doctor said in answer to the question forming on her lips as she watched the swirling mass of light and shadow towards which the cruise ship was heading. The Doctor reached for the communications console. There was a moment when the officer’s voice was stretched like audible elastic and then static. Wyn cried out in horror. The Doctor looked up long enough to see the SS Douglas Adams being swallowed up by the time storm then he raced around the console, pressing buttons frantically. On screen, the time storm was coming closer to the TARDIS now, too. Wyn wondered whether going into it was a good or a bad thing. Then HIS voice became stretched and Wyn’s reply was, too. So were their movements. The Doctor reached out his hand towards her. She reached to him, but it took an eternity for their hands to grasp each other, and the console, the walls and floor of the TARDIS, and The Doctor, too, had a blue-white aura around them. Then time snapped back to normal. Wyn swayed dizzily. She felt like her whole body had been given a local anaesthetic at the dentist and feeling was slowly coming back to her. “What about Jamie and Stella and the other people on the ship then?” Wyn asked. Jamie came around slowly, feeling as if he had been under a general anaesthetic. He was lying on the ballroom floor, covering Stella, who was still unconscious. He knelt up and touched her face gently as she started to come around. Groans and moans and a few swear words around him suggested that everyone was recovering. There was a lot of broken glass and spilt drinks and food, but they all seemed ok. He turned and looked at the door to the kitchen area where their food had been prepared and ran towards it. One of the stewards had the same thought and began to run as well. Inside the kitchen it was more serious. Two chefs had been badly burned after collapsing onto hotplates and Jamie and the steward both grabbed extinguishers to deal with small fires that had broken out when cooking oils had spilled over. There were cuts from sharp kitchen knives and one steward had a severe gash across his head from falling against one of the metal work surfaces. The steward reached for an intercom and called for medical staff to come to the kitchen before giving first aid to the nearest of the casualties. Jamie did the same until the medics arrived and then ran back to look after Stella. She was trying to use her mobile phone. She was becoming frantic as it failed to work. Jamie pulled up his sleeve and tapped at the mini keys on his Time Agency standard issue wristlet. 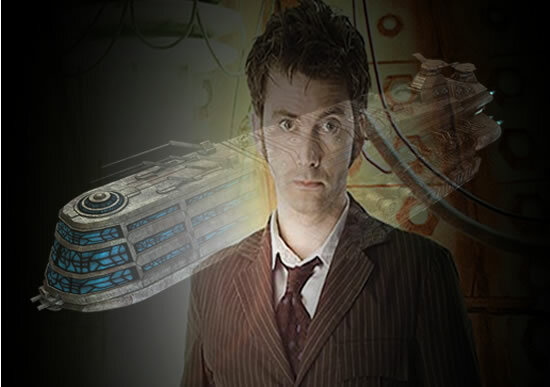 He tuned in the lifesigns monitor and scanned the ship for a passenger with two hearts, the unique presence of The Doctor. There was none. Nor, when he looked for its non-contemporaneous resonance, was there any sign of the TARDIS. “Where IS the ship?” Wyn asked as she looked at the empty space on the viewscreen. He didn’t give the odds. He didn’t want to work them out for himself. The Doctor paused. He looked down at the console. “Years…” Wyn said. She tried to work it out in her head but the maths defied her. “We’d better try,” Wyn said. “Forward or backwards in time?” he asked. 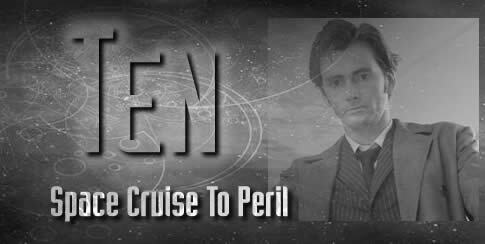 The Doctor nodded and pressed a button on the navigation console then held down a lever. It was almost too easy to set the TARDIS in motion through time. Wyn automatically turned to look at the screen. Usually they travelled through the vortex and arrived in different places in a few seconds. This was very different. It was like watching a video in rewind, except it was the universe that was being rewound around her. Three thousand years passed in five minutes and she saw the destruction of the three planets in reverse. It was too fast to see what caused the disaster except that it was not a natural disaster. A war had raged and somehow they had destroyed each other, two planets being disintegrated and the third falling out of orbit and crashing into the sun, causing the chain reaction that turned it from a bright, warming, yellow sun to a dying red one. As the years rewound the planets looked pretty again, but Wyn turned away from them. She couldn’t get away from the knowledge of what was to come and that tainted the beauty. Besides, she was not interested in planets. She cared only for a ship that was lost somewhere amongst then, and Stella and Jamie lost with it. Stella and Jamie didn’t think they WERE lost. They thought the TARDIS was lost. But they knew they were in trouble, even so. The alien craft had moved into position over the ship not long after they all woke from whatever knocked them out. Through the exo-glass roof of the grand ballroom they could see its dark underside blotting out the starfield. Jamie and Stella held each other’s hands tightly as they looked up at it and wondered what sort of people were piloting it. It didn’t look a lot like a space ship from below, in fact. It looked like somebody had hollowed out an asteroid and fitted warp engine nacelles to it. Jamie thought Stella was right. His own gut instinct was to fear the new arrivals. Then the air shimmered all around the edges of the ballroom and in a clear space in the middle. Jamie recognised multiple transmat beams when he saw them and braced himself for the worst. Moments later they were surrounded on all sides by possibly the ugliest vaguely humanoid species he had ever seen, dozens of them surrounding them and the leader and his attendants materialising in the middle of the ballroom. They WERE bipedal like humans. But there the resemblance ended. The faces when they removed their helmets looked as if they were inside out. There was a skeletal structure that covered most of the features and rose to a horned peak at the back of the skull and over that what looked like sinew and muscle. Beneath the skeletal structure was red flesh. Red eyes looked out through the eye sockets and a lipless mouth was full of sharp incisors that they bared menacingly at the terrified captives. They were in robes of deep red decorated with ornaments made of bone and cloaks of red leather, similarly adorned. They wielded long whips that crackled with energy. A man started to scream and one of the attendants of the leader cracked his whip. It caught the man around the neck and he was enveloped in electric blue light. Briefly the horrified witnesses saw a three-dimensional x-ray of his skeleton and then there was a ghastly rattle as his bones collapsed to the ground in a smoking heap. As screaming and panic broke out the leader called for SILENCE. At least Stella and Jamie heard him call for silence. The rest heard an alien language that frightened them even more. “Why can we understand him?” Jamie whispered to Stella. Again the leader called for silence, and when he didn’t get it his attendants flexed their whip arms. “Ok.” Jamie slowly reached and pulled out his Time Agency ID card and passed it to Stella. “Don’t want him to know I’m official.” He slipped off his wristlet that never left his arm and gave her that, too. Then he stepped forward, hands in the air. “Are you the leader of this puny invading party?” the leader asked in a guttural voice. Silence he slowly got. Proof enough of Jamie’s usefulness. The leader fingered his whip and lashed it out towards Jamie, snaking it around his neck. But there was no murderous power in it this time. Rather it became a collar and leash to control him with. From among the crowd a man came forward. Tall, dignified in a smart uniform of white, blue and silver. The leader cackled with laughter. “This system is ours by conquest, and all within it. You are ours to command. You will be sold as slaves for the greater glory of the Sycorax empire. But before that you will give information about your planet so that, too, can be conquered. “We don’t all come from the same planet,” said the Captain when this was relayed to him. Jamie translated. “At least let the women be,” the Captain pleaded. Jamie hesitated about passing on that request but the Sycorax leader insisted. “Most humanoid species do,” Jamie pointed out. One of the attendants showed the leader something on a hand held computer. Jamie guessed it was a ships manifest or perhaps a lifesigns monitor. In any case, he knew, now, that there were other people aboard the ship than those in the ballroom. Jamie passed on the message. The Captain looked as if he would refuse, but Jamie shook his head. The Captain looked at Jamie, held by his leash like the Sycorax leader’s pet and knew he was speaking from experience about humiliation. He reached inside his jacket. The attendants flexed their whips threateningly. “It’s all right,” Jamie said. “He’s just going for his communicator.” At least he hoped that was what the Captain was doing. This was no time for a brave but futile gesture. He was relieved when he DID, indeed, bring out a communicator that allowed him to contact the rest of the ship’s complement. Jamie happened to glance at Stella at that moment. She was scared, as everyone was, but even so she was suppressing a laugh. Something in what the captain had said struck her as funny. He looked back at the Captain and ran his instructions through his mind. The last part sounded like a code. “Just be ready at my signal,” said the Captain. Jamie passed on the message. If there WAS going to be a futile gesture this was the time with so many people moving around, and the staff and crew, everyone from pianists and singers to hairdressers, cooks, bed-makers, all came into the ballroom and were sorted into groups. The women were made to crouch on the floor around the Sycorax leader who took pleasure in having them at his mercy. Jamie wondered about Sycorax sexuality and whether he had in mind some kind of mass debauchery and decided he was glad to be in his male form just now, even though he was just as vulnerable as the women. As they settled again in their segregated groups, he noted that there were no security uniforms among the crew that arrived. He doubted they were lead by anyone called Lieutenant Beeblebrox, an unlikely name even for the thirty-fourth century. That was the code word, of course. “What HAVE you done?” he whispered to the Captain. Then he knew. The Captain gave his signal - one that was easy to recognise. He lunged at the Sycorax leader, bringing him to the ground. Jamie was dragged down, too, his throat constricted as the leash pulled tight. He didn’t see the security staff burst into the ballroom through the main door, the fire doors, the kitchen, opening fire on the Sycorax guards as the Captain squeezed the leader’s neck with his bare hands. The battle was brief. The security guards had the element of surprise. They cut down the Sycorax guards. But their victory was even briefer. Moments later the air shimmered and twice as many Sycorax appeared out of thin air, whips cracking mercilessly. Two of them grabbed the Captain off their leader, who stood, dragging Jamie up with him. The Captain said nothing in reply. His eyes told of his utter defeat. The Sycorax leader made a hand gesture towards the ones holding him. One of the crackling whips was slowly wrapped around his body, binding him. The Captain screamed as the blue light enveloped his body. But instead of instant death, this was slow and terrible. He burnt very gradually, his skin charring and blistering, his hair and clothes smouldering, his internal organs cooking. His screams echoed around the ballroom long after he was dead. It was even longer before his bones finally clattered to the floor. Nobody dared scream. A few of the women sobbed quietly. Stella kept surprisingly calm. Jamie felt a surge of pride as he saw her comforting one of the Agoradon’s wives who was dangerously hysterical considering how intolerant the Sycorax were of anyone who made a noise out of turn. It had been three hours. They had travelled one hundred and eight thousand years back through time. They had said very little to each other. The Doctor mentioned once that the planetary system was under some kind of military control. There were space stations over all of the planets that didn’t look like they monitored the weather or broadcast television programmes. Wyn didn’t care, even though The Doctor said that it looked as if some hostile force had conquered the peaceful system. She was right, of course. The Doctor knew it. The problems of this system, whatever they were, were not his concern. Even if they were, it was too big a problem for him to do anything about. The Doctor didn’t believe in that Earth axiom ‘fight the battles you can win’ but he did believe in fighting battles that it was possible to fight. That wasn’t one of them. Sometimes being the conscience of the universe meant turning a blind eye to some of its most unconscionable parts. “What’s that?” Wyn asked as something blinked on the TARDIS console. The Doctor bounded around to the communications panel. “Yes,” he cried. “We’ve got a break.” Then his triumphant smile faded. He swallowed hard. “Well, that’s good news isn’t it?” But The Doctor’s expression didn’t look like it was as he set their co-ordinate and they entered the usual time vortex, heading directly for where the ship was. “It’s an automated SOS signal. It activates if the wristlet is no longer on the Agent’s arm or if.…” He swallowed and looked at Wyn. “I’m sorry, Wyn,” he said. But if The Doctor was about to reveal he really WAS a Renegade Time Lord after all, she never knew. He was distracted by what he saw as the TARDIS materialised in ordinary space. There was the SS Douglas Adams. But above it was another ship - if space ships could be organically grown from rock. “It’s a sort of fusion process,” The Doctor said in explanation. Very big, powerful ships, but slow. If this one set off now it would reach the Earth solar system in about 500 years. If it knew where Earth was. Which it will if they extract information from any Earth born person aboard the Douglas Adams,” he added. He looked at the star date. They were in what would be, in Earth years, 1506 AD. If they got information about Earth and decided it would be worth conquering it, they would arrive at about the year 2006. The Doctor froze. He recognised the ship. He knew what species had hijacked the SS Douglas Adams. He had dealt with them before. In his own universe, before he crossed over into Nine’s. 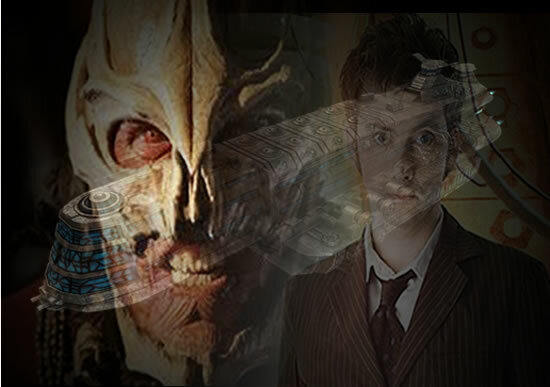 At Christmas 2006, in his universe, he had fought the Sycorax for the freedom of Earth. In this universe that invasion had never happened. Nine had a peaceful Christmas with Rose and her family. But if they got information now about what a teeming, busy place, rich in resources, the Earth was, that could change. Not only did he have to save everyone on board the SS Douglas Adams, but he had to stop something much more consequential to Earth, his adopted home planet, where everyone he cared about lived. To do that, he might have to do something terrible. Something he had raged about when Harriet had allowed Torchwood to do it to the Sycorax ship that had invaded Earth in that other time and place that seemed so long ago now. There was a difference, of course. He had already defeated them that time. They were leaving. That was why he had been so angry. They attacked a retreating and defeated foe. But this foe still held hostages at their mercy. He saw them on the lifesigns monitor. Hundreds of innocent people, their species differentiated by different coloured blips on the screen. He didn’t tell Wyn, but he recognised Jamie, the Gendermorph from Haolstrom, close to what had to be the Sycorax leader - next to a faint and fading blip that still registered as organic matter though no longer living matter. “Please don’t let that be Stella,” he prayed, though as a Time Lord he had no god to ask such a prayer of. “They won’t be for long unless we move,” The Doctor said. He was a bit annoyed with himself for missing what Wyn had pointed out straight away. But there was no time for his bruised ego. No time for qualms, either. Innocent lives were at stake. More of them than anyone but he knew. Jamie cried out in pain as the whip around his neck sent a jolt of electricity through his body. A warning jolt, he knew. His usefulness was not over yet. As he straightened himself up the Sycorax leader repeated his order to him. “What’s this?” Wyn asked as the TARDIS materialised. “Committing an act of war,” he told himself as he stepped out of the TARDIS into the core of the ship’s power source. He felt the radiation as soon as he did. He had about 2 minutes before his body was so saturated with it his molecules would start to break down and he would be forced to regenerate. He needed half that to do what he had to do. It was almost too easy to kill thousands of beings at once. Such power should not be in the hands of one man. But if it had to be, he was the right man for the job. Because at least he knew it was wrong. He didn’t do it with any sense of triumph. He materialised the TARDIS between the SS Douglas Adams and the Sycorax ship and pressed levers and pulled switches frenetically as he extended the TARDIS’s gravitational field to encompass the ship and then piloted it in what, for want of a better word, his human companions tended to call ‘impulse drive’. In the Heart of Gold ballroom with its exo-glass ceiling, humans and Sycorax both saw what was happening. They saw the TARDIS materialise above them. They saw and felt the ship move rapidly away from the alien one. The exo-glass automatically darkened to protect their eyes against the explosion that turned the Sycorax mother ship to burning dust in a few seconds. “Agghhh!” raged the Sycroax leader angrily and he flexed his whip to deal a death blow in retaliation. Jamie cried out in pain, but the crack of energy fizzled out after a few seconds. He was hurting badly from the massive shock direct to his heart, but he wasn’t a pile of smoking bones on the floor and he wasn’t slowly burning to death. He was in trouble though. He clutched his chest as he felt it tighten painfully. He felt Stella’s arms around him as he sank to his knees. And as he slipped into unconsciousness he saw two of the other women attacking the now weaponless Sycorax leader, kicking him where it hurts – the same place as most other species - and punching him to the ground. Around the ballroom the same was happening to his troops, who found themselves outnumbered and unarmed. Stella saw nothing of that. She only saw the TARDIS console room solidifying around her, then Wyn beside her, prying Jamie’s still body from her grasp. That wasn’t true. People HAD died before inside the TARDIS. But it was also true that some had lived. Sometimes the TARDIS could provide a miracle of its own and he was asking it now. “Doctor!” Stella called out, wondering what he was doing, why he didn’t do something practical to help. She was kneeling with Wyn, holding her sister as she, in turn, held onto Jamie and kissed him. He WAS still in his male form, but she didn’t care. She loved him and her equally and her heart was breaking. She cried at the injustice of it all. They had defeated the aliens, saved everyone, except for Jamie. The Doctor screamed as the arc of pure energy emerged from the console and went straight through his own body before enveloping Jamie. Wyn clung to him still and hoped that whatever it was The Doctor was trying to do could help. Then she felt Jamie move. She felt his body shudder as he gasped for breath and his stilled heart beat once again. She saw him shimmer and turn to his female form, then back again twice more before settling in the female version, still dressed in the evening gown from the ball that seemed a long time ago now. But Jamie’s life didn’t seem to be enough for the TARDIS. The Doctor stepped back from the console as the light increased. He was startled when both doors flung open and the energy poured out through it. He saw the pile of bones right outside enveloped and before his eyes flesh and sinew, organs and skin were replaced, even clothing covering the body before the Captain of the Douglas Adams struggled to his feet, staring in amazement at the blue box that had no business being in the ballroom of his ship. The energy continued to fly around the ballroom and on the lifesigns monitor The Doctor saw what had been dead tissue traces become living beings. The TARDIS was bringing life back to all the innocent victims of the Sycorax attack. There would be no needless deaths in Earth’s future, either. He’d even saved Harriet Jones’s political career in this universe. Because he wouldn’t have to punish her for the needless deaths she had caused in the version of events he remembered. The Sycorax deaths he had caused himself were for him to deal with in his own conscience. Whatever he thought went unexpressed. The TARDIS came to his rescue, sounding the proximity alarm that told him there was another ship approaching. His hearts sank as he wondered if there was another Sycorax ship in the vicinity. But then Stella gave a sudden yelp and grabbed at the wristlet on her arm. She gave it back to Jamie who looked at the message on it. “They’ve got a time-drive ship?” The Doctor asked. Jamie nodded. “They can help. Between your lot and the TARDIS we can ‘tow’ the Douglas Adams back to the thirty-fourth century. They can arrest the rest of the Sycorax, too, and deal with them. There’ll have to be an incident report. Even if nobody is dead, there’s still an act of piracy to deal with.” He sighed. Making statements wasn’t something he enjoyed. He would prefer to leave and let others clean up the mess. But this time he doubted he would be able to. He was right. They had to remain in orbit around Orinic IV for several days while the thirty-fourth century authorities tried to put together an incident report that they could possibly submit to public scrutiny that include statements about time storms and alien hijackers, exploding ships and people coming back from the dead, to say nothing about an antique police telephone box at the centre of it all,. Wyn didn’t mind. It meant more time with Jamie. She knew that time was limited now. And she was not at all surprised when the last day came. Wyn looked disappointed. Worse than disappointed. She clung to Jamie’s arm tightly. The Doctor looked at them both. Wyn’s eyes lit with joy as she ran to pack a case for her journey. Jamie tried to find a way to express her gratitude. Stella looked at Jamie and The Doctor and ran the last few sentences back in her head and THOUGHT she understood what they were both saying. But she wasn’t sure and she certainly wasn’t going to ask The Doctor to explain. She didn’t think that conversation was ever going to be repeated in front of Wyn, anyway. “If I come across him again I’ll say hello from you.” The Doctor promised. Then Wyn was back with everything she thought she would need for three months in the fifty-first century. She hugged The Doctor, kissed him on the cheek and told him to look after Stella. Then she hugged Stella and told her to look after The Doctor. She took hold of Jamie’s arm and whistled for K9 who hovered dutifully at her feet. The Doctor and Stella watched them go then turned back into a much quieter TARDIS. The Doctor grinned and pressed the dematerialisation switch. There was a universe of surprises out there.